يوفر فندق The Reef Retreat Hotel ظروف إقامة راقية وهو خيار رائج للسياح ولرجال الأعمال أيضاً. يقع في منطقة شواطئ, مطاعم, رومانسية من المدينة. يمكن من هنا للضيوف الاستمتاع بسهولة الوصول إلى كل ما تقدمه هذه المدينة النابضة بالحياة. يشكل هذا الفندق ملاذاَ مريحاً للاسترخاء ويمنح زواره فرصة للاستجمام والتجدد، وهو يقع على بعد خطوات من المعالم السياحية الكثيرة للمدينة. يقدم The Reef Retreat Hotel خدمات لا غبار عليها وكل أشكال اللياقة وحسن الضيافة اللازمة لإسعاد ضيوفه. يقدم الفندق فرصة للاستمتاع بشريحة واسعة من الخدمات بما فيها: واي فاي مجاني في جميع الغرف, توصيل من البقالية, خدمة غسيل ذاتية, تسجيل وصول/خروج سريع, تخزين الأمتعة . ادخل إلى واحدة من الغرف 36 وتخلص من عناء نهار طويل بمساعدة مجموعة كبيرة من الخدمات كمثل تلفزيون بشاشة مسطحة, حوض الاسترخاء, غرف لغير المدخنين, مكيف هواء, مكتب الموجودة في بعض الغرف. كما أن مجموعة الخدمات الواسعة الموجودة في الفندق لضمان راحتك تترك لك الكثير من الخيارات لقضاء وقتك أثناء فترة إقامتك. اكتشف مزيجاً ساحراً من الخدمة الاحترافية والخيارات الواسعة من وسائل الراحة والمتعة في The Reef Retreat Hotel. التدخين ممنوع منعًا باتًا في هذا العقار. لا يُسمح بالتدخين في جميع المناطق، بما في ذلك غرف النزلاء والشرفات والمناطق المشتركة. Great hotel. Awesome value. Location is good. Also helped us out with extras for a birthday. Very nice place to spend your time! Perfect location and everything required for a relaxing holiday. We chose a cheaper room which was comfy. The BBQ and social area was in a beautiful setting next to the pool. Would have liked for a little more sun into the pool area. Happy to recommend the Reef Retreat. Just a two minute walk from the beach. Excellent location, reasonable value and met my expectations. Terribly thin walls. You hear everything and everyone. Poorly designed room layouts; toilet is literally one night stand away from the headboard in the single-spa rooms. Tiny parking spots, but street parking is plentiful. Bugs, a whole lot of them, but you are in the rainforest so it's expected. Location, flexibility of staff, Cleanliness. The Reef Retreat Hotel was exactly what I needed while visiting Palm Cove for my friends wedding. 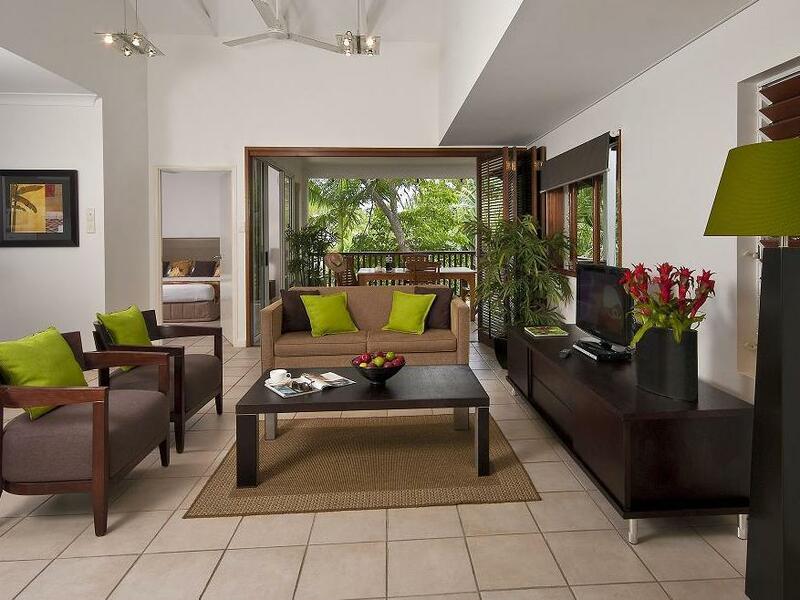 It was a very central location with ease of access to all the facilities that Palm Cove has to offer. enjoyed the peaceful well kept surroundings. staff were helpful. location was convenient. Room was in good order and of a good standard. Recommend the place. Thoroughly enjoyed our stay. Close to everything. It was quiet and peaceful. If you have an issue with stairs request a room on the ground. We booked a 2 bedroom apartment which was large and roomy, however the 37 stairs up to the room with 2 small children wasn't ideal and a long way up with a heavy suitcase. Will definately stay here again. Nice quiet location, beautiful hotel and pool, out of Cairns but still close enough to enjoy everything. This is a wonderful place to stay, especially for a nice quiet get away for 2. Palm Cove is out of Cairns enough to be quiet but still close enough to be convenient. The heated spa and pool were perfect and the gardens around the hotel were beautiful and natural. The staff are friendly and very helpful, even arranging reef trips and other activities if you need them to. We really enjoyed our trip and wouldn't hesitate to stay here again. Has a kitchen ...great for cooking simple meal and breakfast. Delightful and will definitely recommend to friends and family. A good size balcony with no view which was different from the photo we saw before we made the booking. Quite a good size room but the layout and design was poorly done. No comfortable chairs in the room. Not much storage room. No safe. Paid internet connection was slow. The pool was small. This hotel has large rooms, comfortable beds and the amenities of a serviced apartment. It is one block from the ocean and walking distance to Palm Coves many excellent restaurants. The hotel was clean and service good and friendly. Wi-Fi was not free but was chargeable for actual time used at $3.50 per hour. All in all very good value for money and I would recommend this hotel to anybody considering saying at Palm Cove. Across the road from the beach!!! Great bed! 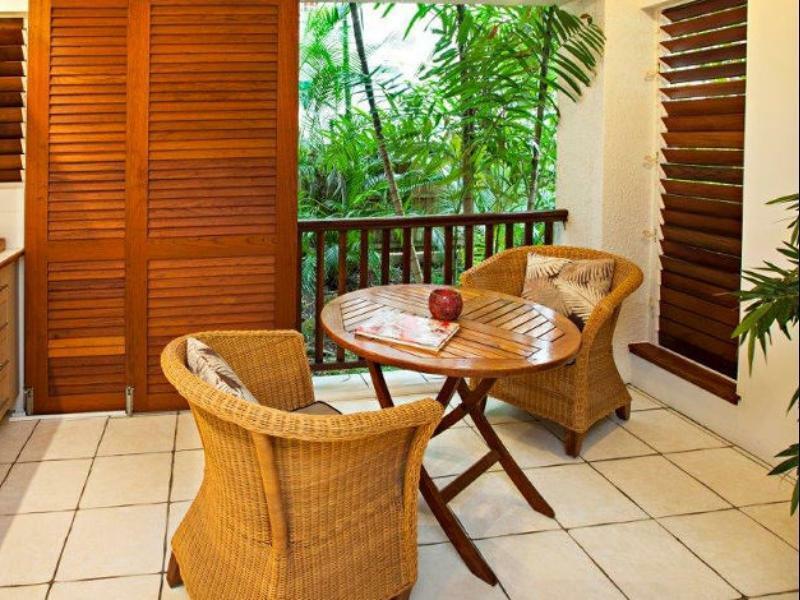 We booked The Reef Retreat 3 bedroom apartment for a few days while in Palm Cove. It was great! The apartments are across the road from the actual resort which was no problem. There was a pool right next door to us which only we used! The main area had a great pool and we used their BBQ facilites most nights. Clive at main reception (and his daughter) were so helpful! It had everything we needed! Convenient location to restaurants beach and convenience stores. Staff very helpful and informative regarding tours and local shops etc. The room was very comfortable with a lovely bathroom and outdoor area.